Jeff Johnson is an Assistant Professor of Computer Science at the University of San Francisco. He is also a principal at Wiser Usability, a consultancy focused on elder usability. After earning B.A. and Ph.D. degrees from Yale and Stanford, he worked as a UI designer, implementer, manager, usability tester, and researcher at Cromemco, Xerox, US West, Hewlett-Packard, and Sun. He has taught at Stanford, Mills, and the University of Canterbury. He is a member of the ACM SIGCHI Academy and a recipient of SIGCHI's Lifetime Achievement in Practice Award. He has authored articles on a variety of topics in HCI, as well as the books GUI Bloopers (1st and 2nd eds. ), Web Bloopers, Designing with the Mind in Mind (1st and 2nd eds. ), Conceptual Models: Core to Good Design (with Austin Henderson), and Designing User Interfaces for an Aging Population (with Kate Finn). 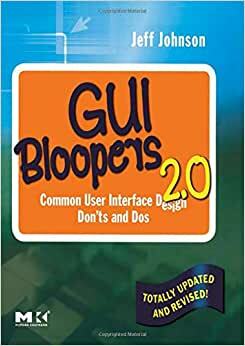 I would recommend this text for those interested in improving their GUIs, it can be a little unclear sometimes (there are some chapters where it seems like the author is contradicting something he said in a previous chapter), but overall this was an interesting and useful book to read. The introduction of programming tools such as VisualBasic probably contributed to the misperception that designing a form was something easy to achieve. Using drag and drop controls to build a form certainly is, but creating an unambiguous and task-oriented screen flow is another story. Jeff Johnson did an excellent job. The chapters arrange the "bloopers" into meaningful categories (GUI Controls, Navigation, Textual, etc) and the table of contents makes it very easy to locate a specific topic. Personally, I like his approach of "Don'ts followed by Dos". Presenting an example of bad design first, forced me to try to spot where the mistakes were (not always an easy task) and this contributed, in my opinion, to a better learning experience. Another nice surprise was to learn in appendix B, the way this second edition was "usability-tested" and also, a very important although not so obvious concept, "Reviewing is not usability-testing". This book is very easy to read and understand and I would certainly recommend it to every developer (from beginner through to senior level) involved directly or indirectly with any GUI design or implementation. 5.0 颗星，最多 5 颗星Excellent. Get this book if you are a developer. I would have to say this is my favorite "developer" book I have ever purchased. It is packed with extremely helpful examples of poor UI design, and how to fix it. The contents have helped me give much more meaningful reviews during development and acceptance testing. Well done. This book is aimed at programmers and software developers who might not have much if any formal training in UI design and interaction design. Each chapter is named after a class of common errors (e.g. 'Navigation Bloopers', 'Taking control away from users', etc.) and gives many examples of the error, and shows how to fix the errors. The book seems to focus about equally on desktop application UI and web UI, so both types of developers will find it handy. Note that there's probably not much new here if you're already an experienced UI/interaction designer or usability expert. Very good read, very useful to me: I'm one of his target audiences, a software engineer who has to develop a UI for a new feature as part of my coding project, without the help of any UI expert.